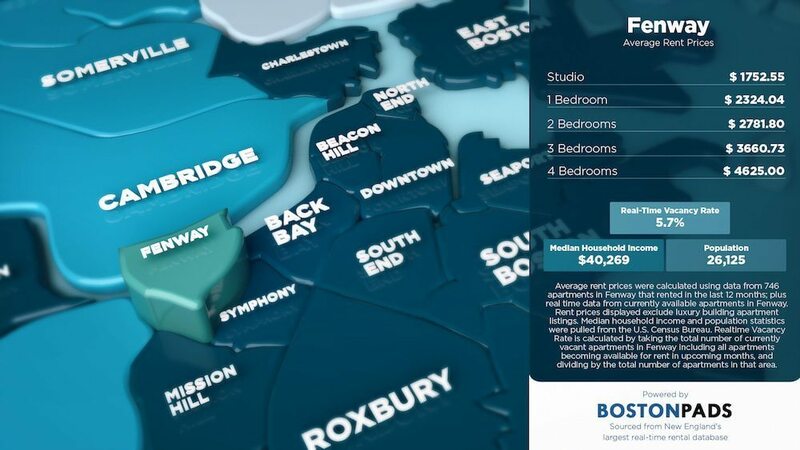 Boston Pads recently published a series of infographics showing the average rent prices in 22 of the most sought after neighborhoods in the Greater Boston area. 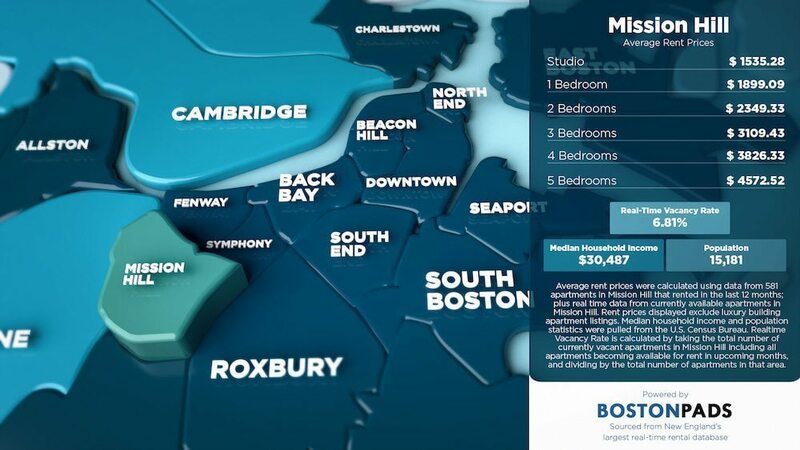 Utilizing their extensive database of over 156,000 Boston apartments, they were able to calculate the average rent price for most of the areas in close proximity to the city. Average rent prices were formulated from 8,884 apartments that were either rented within the last 12 months or that are currently listed as available. 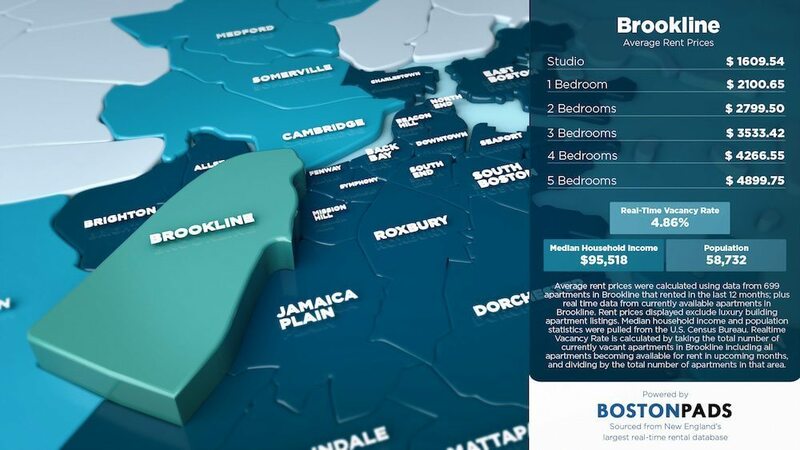 These averages specifically exclude apartments that reside in luxury buildings. The Real Time Vacancy Rate was calculated by taking the sum of the total number of apartments available in that area and all the units that will become available in the upcoming months, and dividing by the total number of apartments in that area. Population and median household income was pulled directly from US Census Bureau. 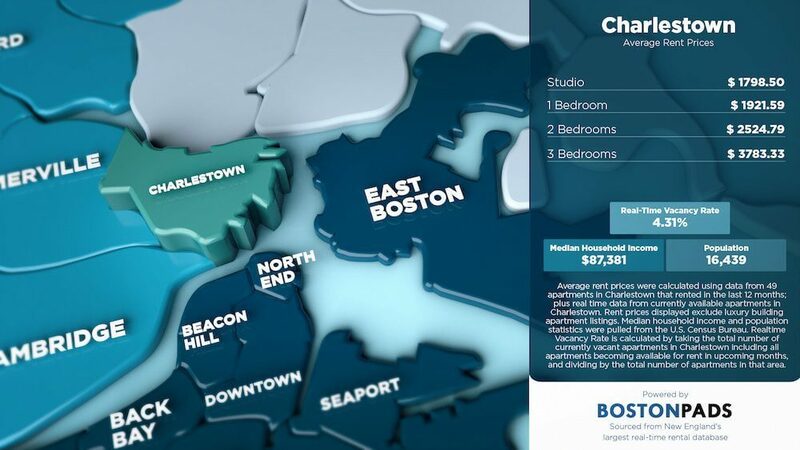 Not surprisingly, the average rental prices of areas near downtown Boston are obtaining the highest rent prices. 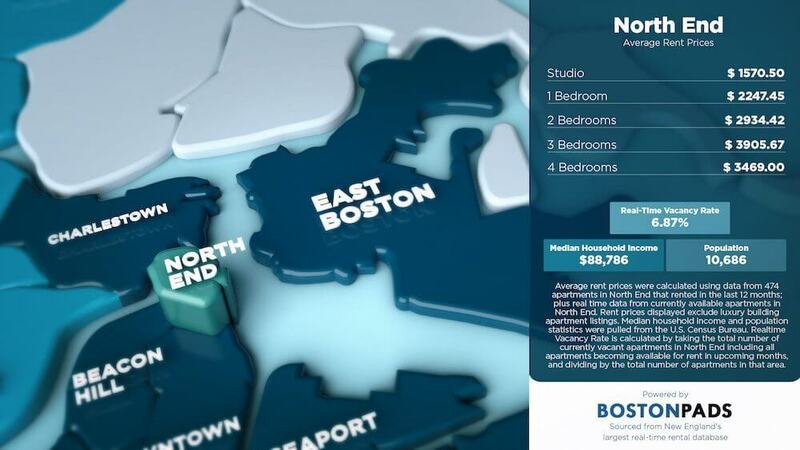 The neighborhoods of Back Bay, Beacon Hill, North End, Symphony, Fenway, and South End are obtaining the highest rents in and around the city for non-luxury apartment buildings. 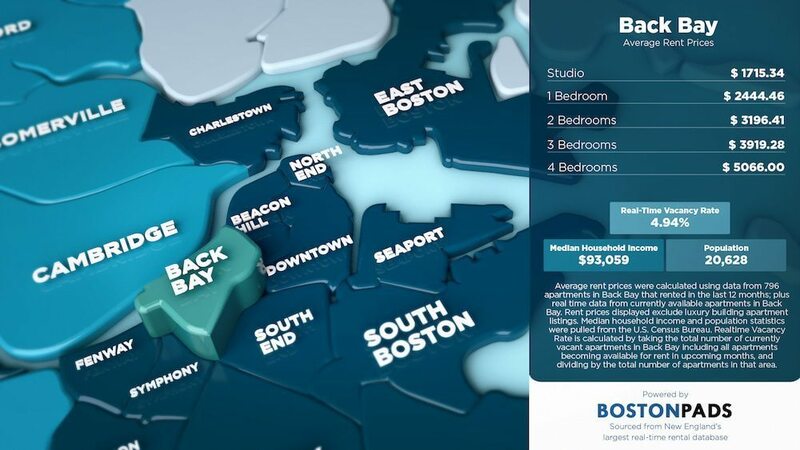 Average rent prices in Back Bay are the highest in the city right now, ranking as the most expensive place in Boston to rent a 1 Bedroom apartment at $2,444/month as well as the highest 2 Bedroom price at $3,196/month. 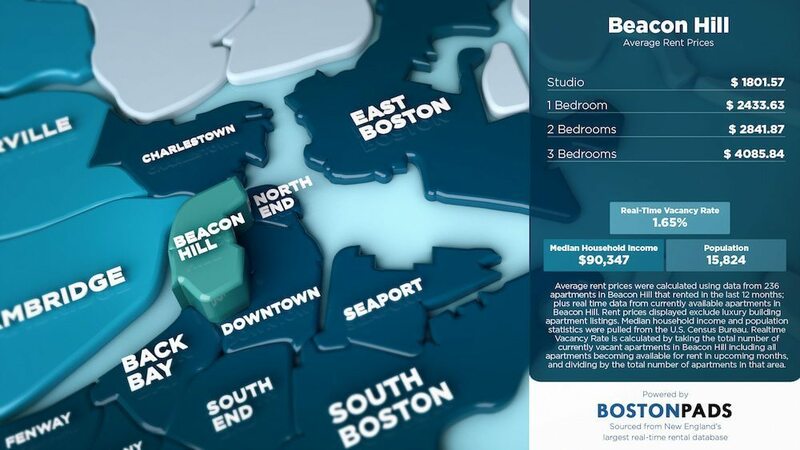 Rent prices in Beacon Hill currently ranks 2nd highest for 1 Bedrooms at $2,433/month and 5th highest for 2 Bedroom apartments at $2,841/month. 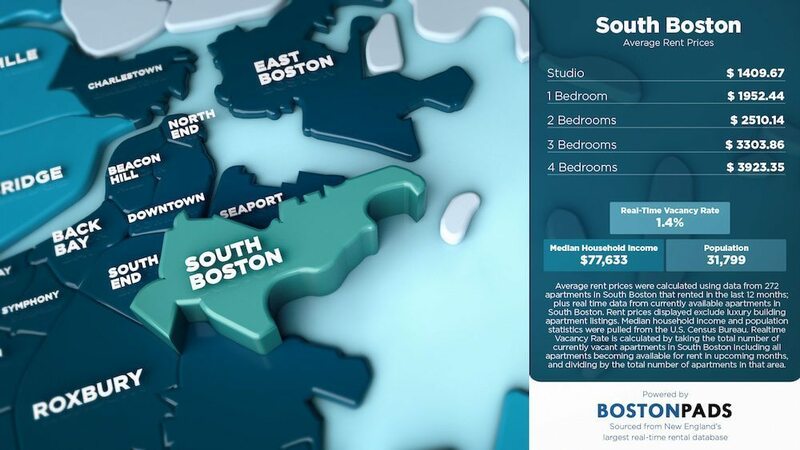 The neighborhood of South End ranks 3rd highest in Boston for 1 Bedroom and 2 Bedroom apartments, seeing an average of $2,362 and $2,996 respectively. 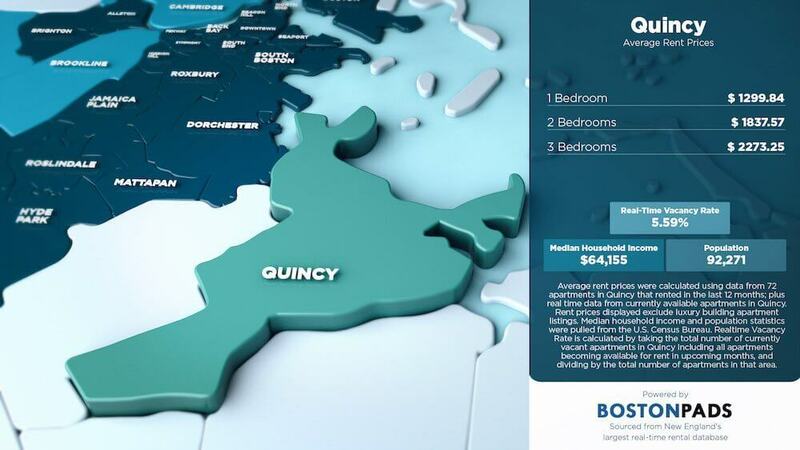 For those on a budget, the best options close to the city to find an apartment in their price range are Quincy, Dorchester, and Malden. 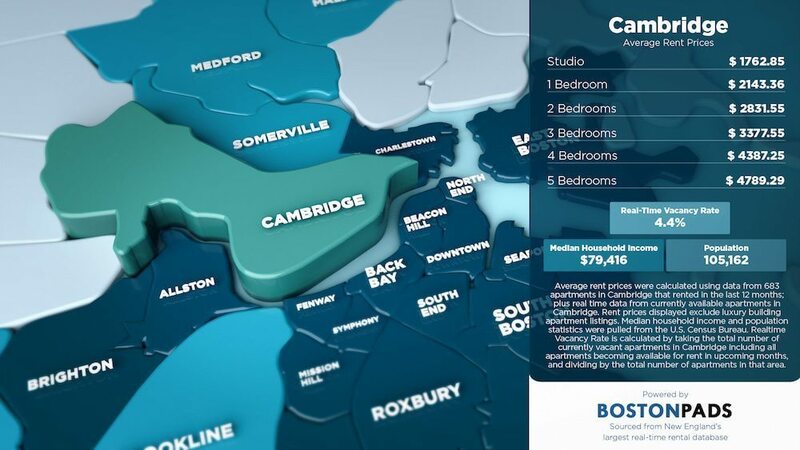 These three towns showed the lowest averages for renting a 1 bedroom and a 2 bedroom apartment among the 22 areas sampled. 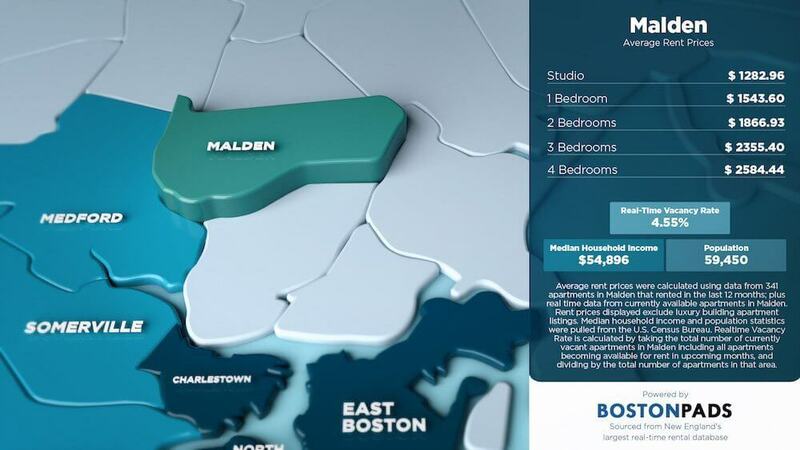 Neighborhoods like East Boston, Medford, Jamaica Plain, Allston, and Roxbury are also among the most affordable neighborhoods close to Boston. 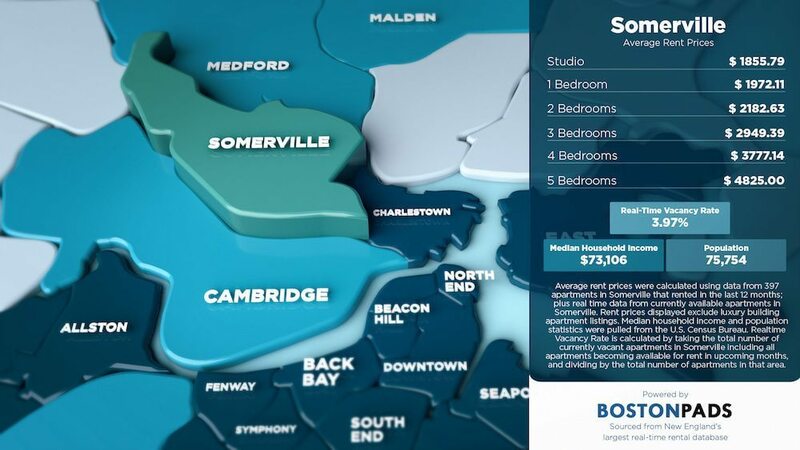 Ultimately, the data suggests that if you plan to live in one of the neighborhoods near downtown or one of the closer suburbs to downtown Boston, you can expect to spend over $2000 for a 1 bedroom and above $2700 for a two bedroom. Below are links to all 22 infographics, featured on some of our local sites. 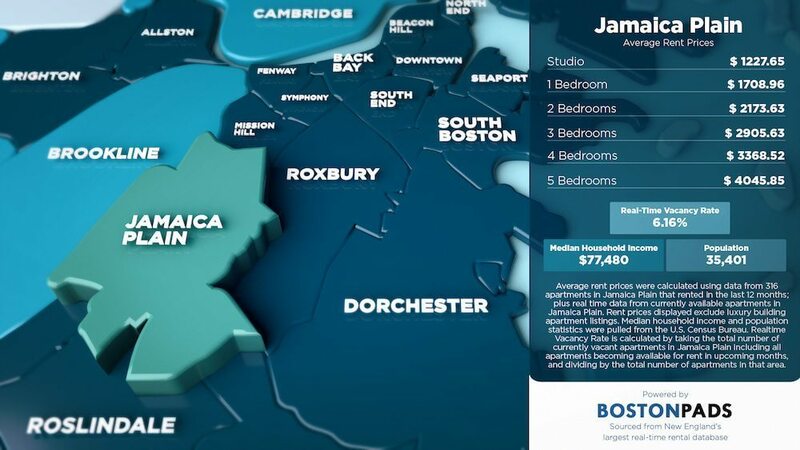 This data was sourced from the Boston Pads database, comprised of over 156,000 apartments, 500,000+ property images, 47,000+ image galleries, 8,000+ apartment videos, and over 16,000+ landlord contacts. Landlords, renters, buyers and sellers can call in 7 days a week to get real time data and much more. Their vast network of over 80 locally focused real estate websites and 100 social media pages are updated with new listings and information on a daily basis. 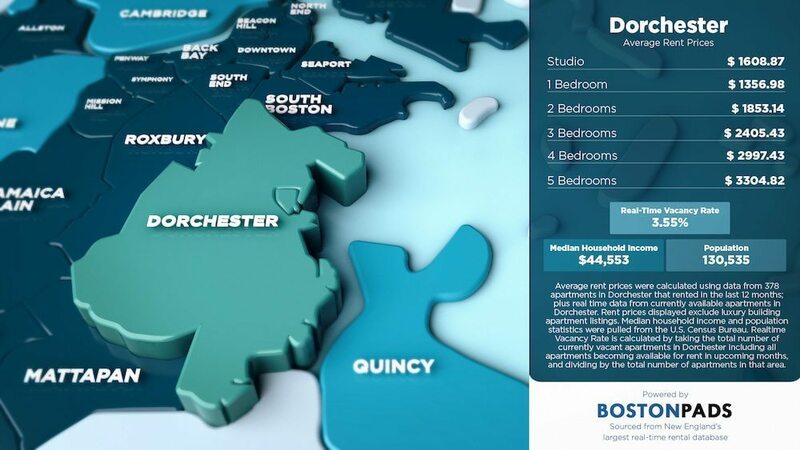 A dedicated team of Boston real estate professionals calls daily to update these listings, ensuring the information you’ll find on Boston Pads’ websites are the most accurate you can find. 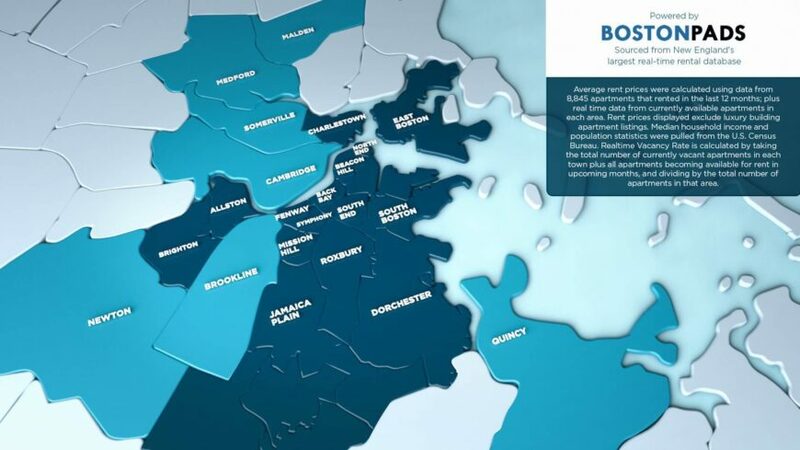 It is this commitment to the best real time real estate data with a keen local focus that has propelled Boston Pads to build their network of landlords to over 16,000 strong. 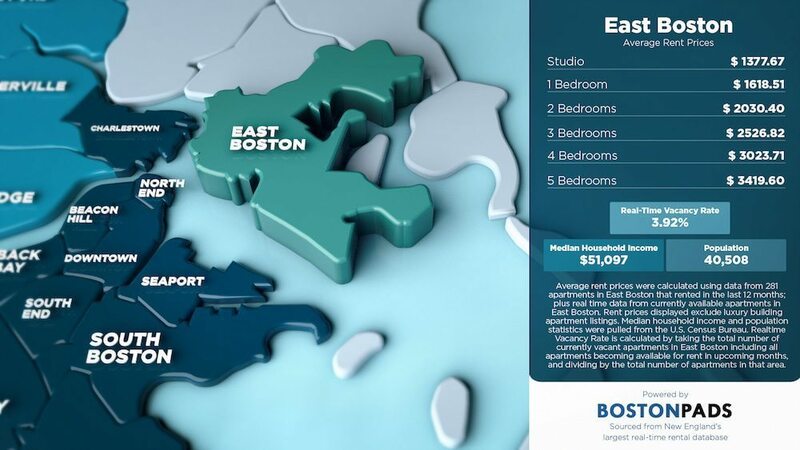 Through the use of innovative technologies, Landlords and property managers that list with Boston Pads receive the widest marketing coverage and support for their available units. 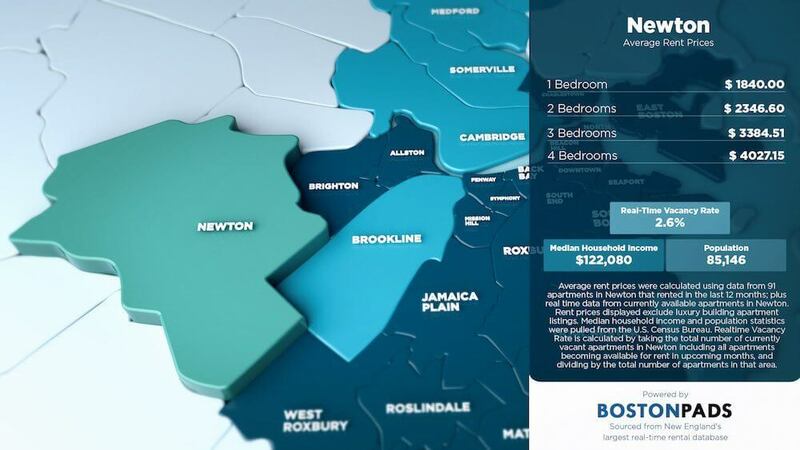 From one source they can syndicating listings to all the national portals like Zillow, Trulia, Craigslist and more, as well as the Boston Pads network of over 80 local websites and 100 local social media pages on Facebook and Twitter. 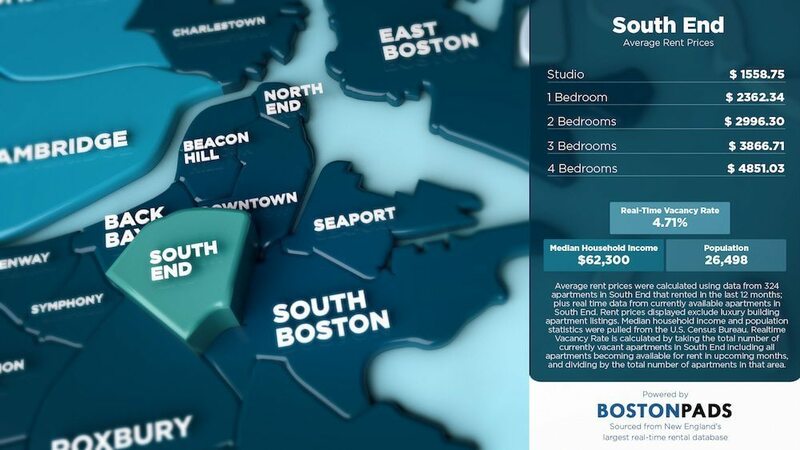 The Bostonpads.com platform helps property owners significantly reduce time spent on gathering and providing data to smaller disparate sources and constantly re-submitting and managing listings. 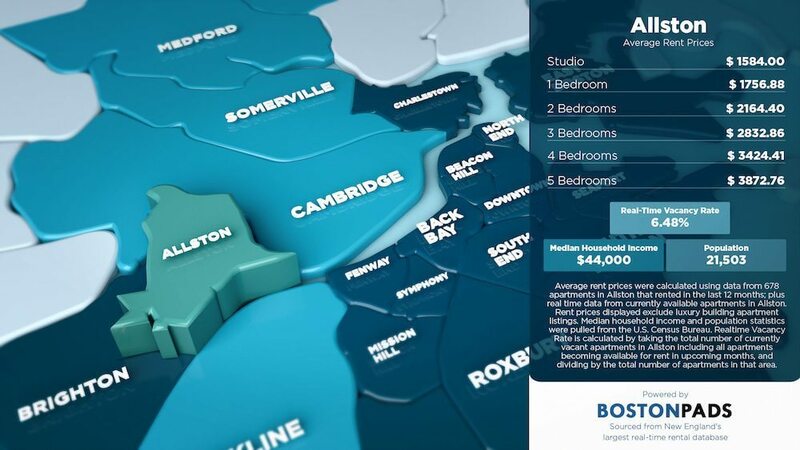 By combining the most comprehensive marketing with the strongest data, Boston Pads has distinguished itself as the real estate and information technology leader in New England. Their platform is scalable and adaptable to any market, and can be used by any agency or landlord to gain access to marketing and real estate tools that can help them gain an edge on the competition.